Saying he&apos;s sorry to his fans? Justin Bieber was spotted filming what appeared to be a music video on Punta Chame beach in Panama on Monday, Jan. 27. The recently arrested 19-year-old singer seemed to be singing while walking along the beach with a camera filming him. Wearing a backwards cap, turquoise tank top, baggy black shorts and sneakers, the "Boyfriend" singer looked emotional while hamming it up for the video. Bieber used dramatic hand gestures to convey his feelings while going for a solo stroll by the water. Bieber has been accompanied on his trip to Panama by model and rumored girlfriend Chantel Jeffries. 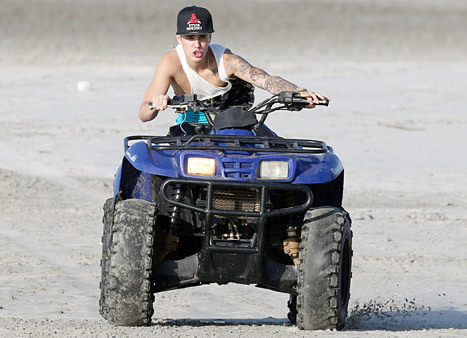 The twosome were spotted going for a boat ride together — Bieber went shirtless, she opted for a bikini — on Sunday, Jan. 26. The Canadian singer traveled to Panama shortly after his Jan. 23 arrest for DUI, resisting arrest, and driving with an expired license in Miami.